NEW GENERATION MEN'S SHEEPSKIN COATS! 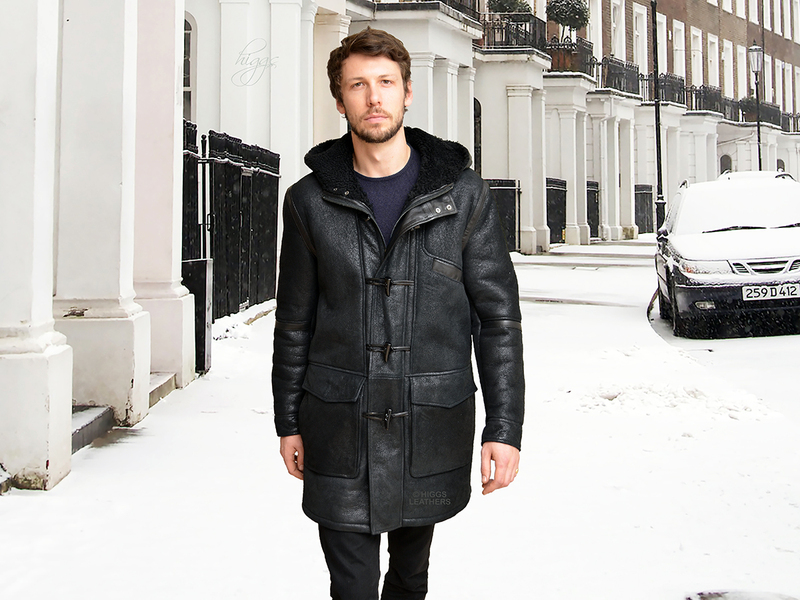 Modern take on the classic style men's Sheepskin duffel coat. Made from heavy quality extra durable soft supple semi Nappa "Crackle" Leather finish, Antique Black shade Sheepskin. The Sheepskin hood can be buttoned high in the neck or turned down away from the face as pictured. Straight easy cut body and sleeves, deep plunge pockets with matching flaps that can be fastened with concealed metal press studs. There are also full size pockets with side openings behind the flap pockets plus a medium size slanted breast pocket trimmed with Black Patent leather, giving a generous total of no less than five pockets, most unusual in a Sheepskin coat! There are bands of Black Patent Leather around the armholes and centre of the sleeves. The coat fastens with a strong metal zip and has a fly front with traditional toggle and loops made from Black Patent Leather that conceal the zip. A wonderfully warm, hard wearing coat designed to be just that little bit different from the traditional Sheepskin Duffel coat! Will give many years of good wear!